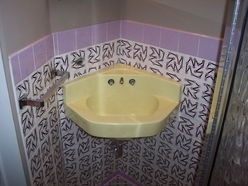 Resurfacing is a great alternative to replacing tubs and other surfaces. 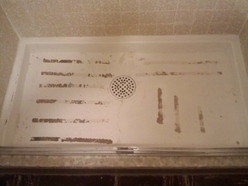 It can be used when cleaning has become too difficult from years of abrasive cleaners or from dirt and soap scum that are trapped in your tub. Resurfacing can also restore your surfaces if they are damaged, severely stained, have chips or a previous resurfaced coat is peeling. 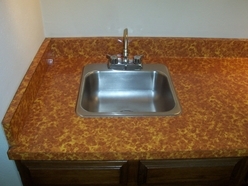 Also, Resurfacing is the perfect option for surfaces that are just out of date and need a color change. 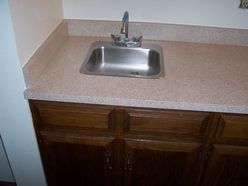 The below slide show gives examples of before and after Resurfaced surfaces. All the above examples can be saved from the costly experince of replacing them! 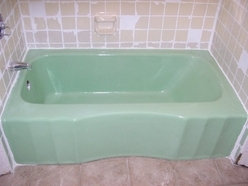 Replacing your bathtub or other surfaces involves not only the cost of the new tub, counter, ect, but the added expense of replacing wall / floor tile, wall board, plumbing, hardware and labor. 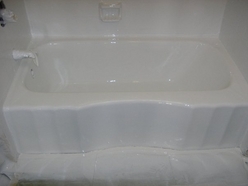 Refinishing quickly transforms your tub to a sparkling factory-new finish. 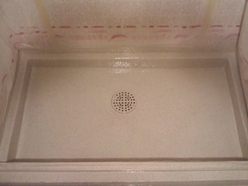 Refinishing your existing bathtub is the most economical way to revitalize your bathroom or kitchen and you will realize a savings that can be as much as 80% over replacement costs! Click Here to visit our GALLERY to see before & after pictures! The secret lies in the ability of the compounds we use to fuse on a molecular level to the substrate, becoming a permanent part of the original surface, unlike bath liners. We use a Acrylic Urethane System that is used widely for aerospace, maritime and industrial purposes to give super tough protection. The most crucial difference in our system is the number of chemical bonds that holds the products we use together. The higher the cross-linked density, the higher levels of overall film durability and lifespan. The products we use have a fully-linked density to help provide quality results! 1. Our technicians will set up a high powered ventilation system. 2. Mask and tape off surrounds areas to protect them from our chemicals. 3. 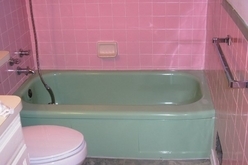 Remove the old caulking from around the tub. 4. If the tub was painted prior, we will need to strip the previous coats off. 5. 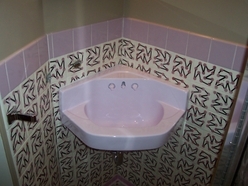 Then we will acid wash (etch) the tub. 6. Our technicians can also repair any chips, holes, rust, and cracks to a smooth finish. 7. 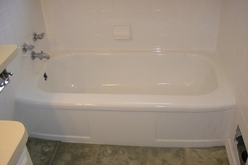 The tub is primed and once the top coat is completed your tub will be ready to use within 24 hours! *Drains can be pulled if needed for an additional price. We also have a additional drain cover option to help mask old drains with having to pull them. ASK ABOUT OUR Non-Slip SURFACES. For an additional fee, a permanent Non-slip polymer can be applied to bottom surface of any porcelain, ceramic and fiberglass tubs helping to assure a safe and slip resistant surface!